I hope everything about the title has you drooling. Last year Alex bought me the mother of all waffle makers. One where I can bake up TWO waffles at once. Seriously it is awesome. I’ve hosted several brunch parties since first cracking open that heavy Christmas present. At the beginning I experimented with several waffle recipes before falling in love with these light and airy, buttery and crispy, waffles. A new year needs a new waffle recipe. When I saw the Beer Waffles posted on The Sugar Hit earlier this month I knew I needed to give them a try. 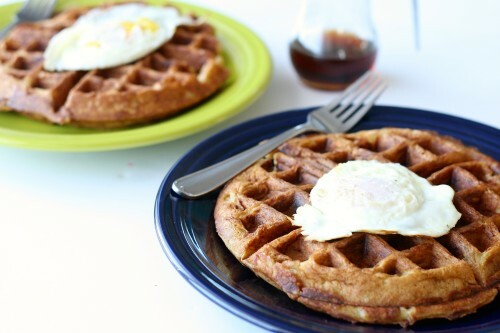 A savorier waffle for brinner. Tell me you love brinner (breakfast for dinner) too. 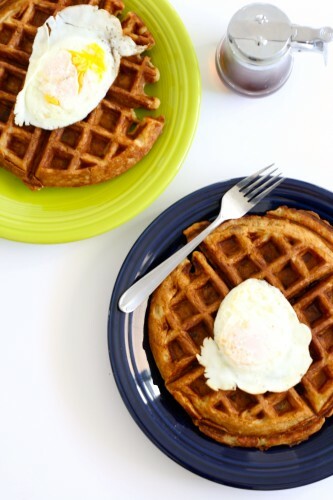 If you haven’t ever had breakfast for dinner you MUST make these waffles for your first brinner. You will be hooked! 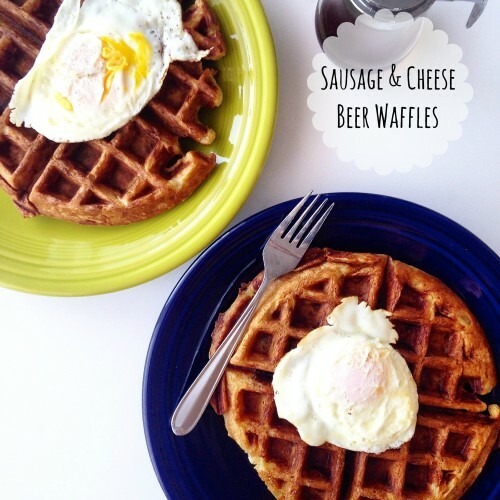 A good quality shredded sharp white cheddar and crispy browned sausage links are mixed into the beer laced waffle batter giving you a cheesy, salty, and malty flavor explosion. So satisfying. Throw a fried egg on top of that ish and you are set! These look awesome – love it! Thanks Sarah! Your waffles were delicious!! Did you ever see the episode of “Friends” where Rachel made some awful dessert that she added meat too on accident. . .but Joey loved it? Whenever we see a recipe where we love all the ingredients, my husband and I echo Joey from that episode. . .”What’s not to love? Sausage. . .good. Cheese. . .good. Beer. . .GOOD. 🙂 I thought of that when I read this delicious recipe! Yes Jen! I can’t believe I didn’t think of that one because my thoughts were so very similar. Mmmm, it sounds like all of the best foods are together in one dish. I’ll have to try making it for breakfast! All the best! I hope you enjoy. WOW! What an incredible dish, sounds amazing! What a fun and funky breakfast idea! These honestly sound perfect for a guys night meal. Love it! I think it would be a great way to get guys on board for breakfast for dinner. I actually drooled reading this recipe! I am going to have to make some, and remind myself that waffles don’t always have to be sweet food related! Switching them up to savory was nice. Sausage and Cheese with waffles all together. Yep making these. Oh dear, this looks so good, makes me hungry just by reading 😀 I will definitely try these ones out! These sound perfect for a nice weekend brunch. I think they would be awesome for Father’s Day….maybe I will have to make them for a special someone. I cannot wait to try this! Do you think this would be doable with a GF flour? I haven’t tried this specific recipe with gluten free flour but I have successfully made gluten free waffles from a mix. Let me know if you try it. I am a huge waffle fan, but have never stuffed them before! Great idea and recipe! 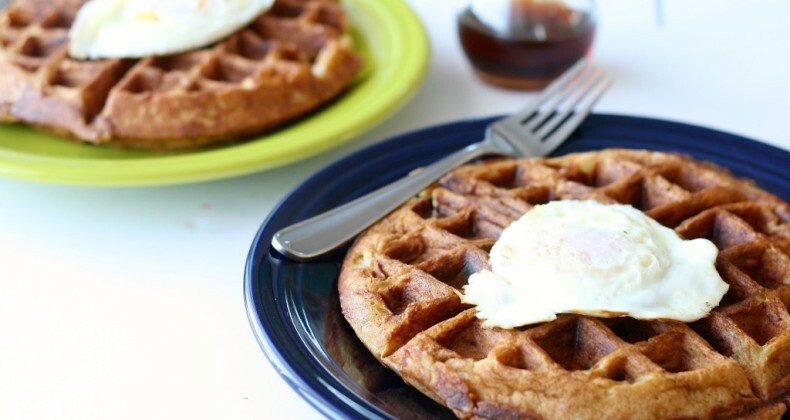 It is a fun spin on a delicious waffle! Oh wow! I bet my fiancé would love this! This honestly makes me a bit nervous. I love all the ingredients but put them together and I’m a bit scared. None-the-less, these types of things always end up surprising me by being amazing! Kari they work so well together. Enjoy! I am pinning this!! My fiance and I will LOVE this! Funny how many commenters said their boyfriend/husband will love this.